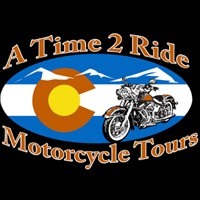 A Time 2 Ride provides custom motorcycle rides in Colorado for locals and visitors. Designed for as few as two to as many as 45 people, our motorcycle tours are personalized for your maximum enjoyment. A Time 2 Ride provides custom motorcycle rides in Colorado for locals and visitors. We will take as few as two people to as many as 45 riders. Every single tour is fully tailored - choose your own route, choose your own destinations, choose your own destinations, choose your own special options, choose your own schedule, choose your own bike, and choose your own road types. Don't worry if you're not sure. Just tell us what you like and we'll take care of everything.